In my last post, I detailed some of the very gory things that would happen to a human being in a high-gee centrifuge. Then I remembered that I have access to a high-gee centrifuge. Sort of. You see, I’ve got one of those fancy front-loading washing machines. It saves time on drying by spinning your clothes at a ridiculous speed at the end of the wash cycle. And when I say “ridiculous speed”, I’m talking 1,100 RPM (at least, according to the manufacturer). That’s 18 revolutions per second! I measured the drum’s diameter at 55 centimeters. If you do the math, it tells you that the acceleration on the inner surface of the drum, when the thing’s running full pelt, is 372 gees. Okay, so it’s not ultracentrifuge material, but that’s still a lot of acceleration. 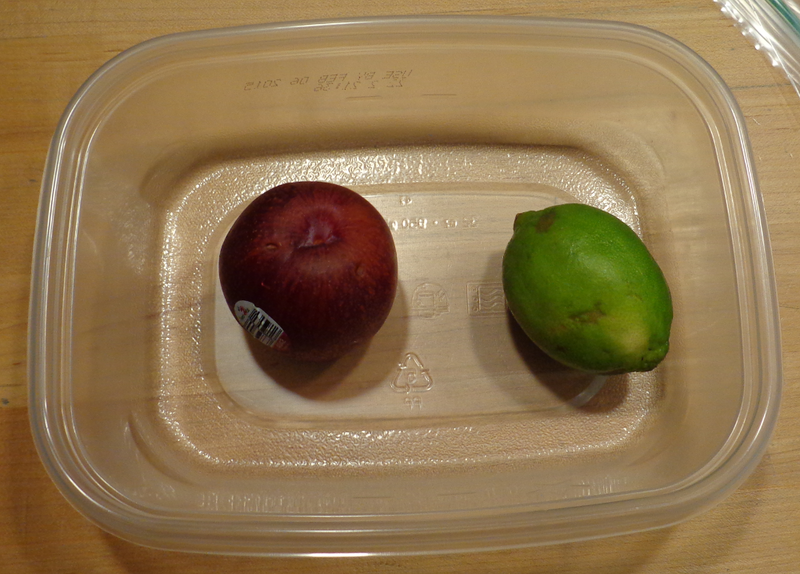 That’s a plum and a lime. The plum was pretty soft. We had a firmer one, but it wouldn’t fit in the container, and, crazy as I am, I didn’t want to risk splattering the inside of my washing machine with plum pulp. The lime, on the other hand, was so hard it could probably cut glass. Either way, these are our volunteers (it was a pain in the bum getting them to sign the release forms, let me tell you…) Let’s seal them in their space capsule. I must say, they look pretty brave, as far as produce goes. 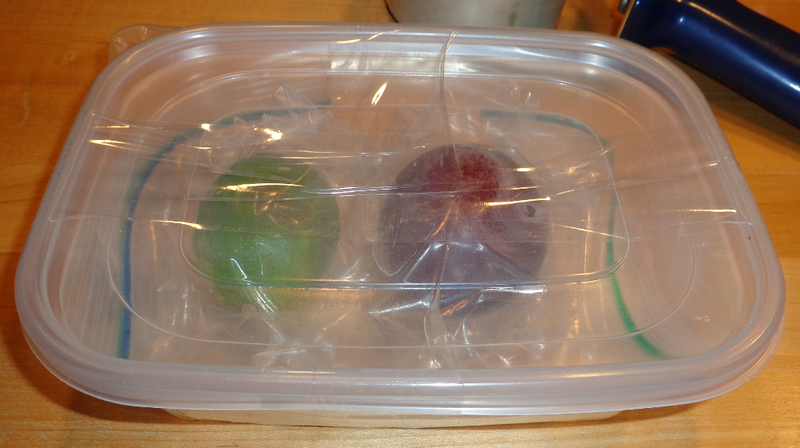 Note the extra precautions: each fruit sealed in an individual bag, and packing tape to seal up the container. I didn’t want it flipping over during spin-up and seeping stuff everywhere. But enough talk! Let’s get ’em in the centrifuge! There they are, their capsule strapped into place. Can you tell how worried I was I’d end up painting the inside of my washing machine with fruit? 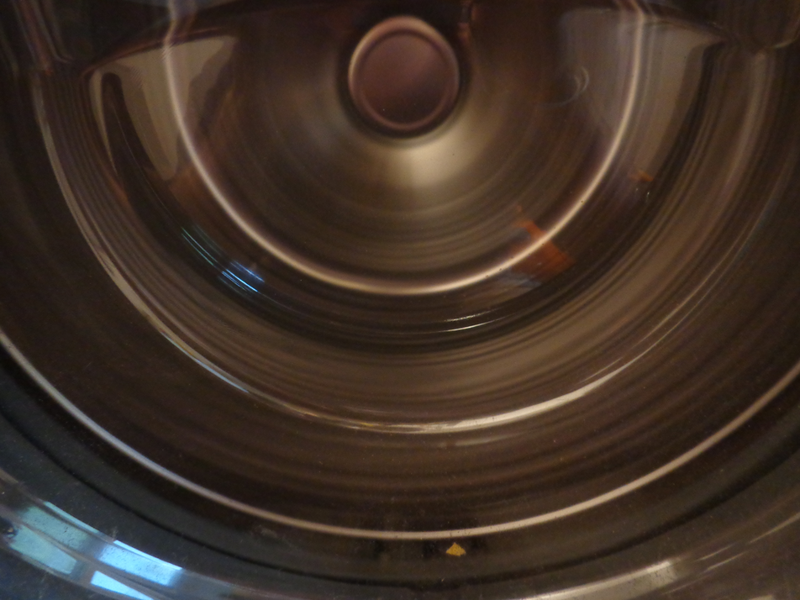 I could’ve sworn I heard a high-pitched shriek when the washer reached maximum spin. Then again, I’ve been hearing a high-pitched shriek ever since the Exploding Kikkoman Bottle Incident, so perhaps it’s just me. This is what the picture above would have looked like if I’d remembered to turn the flash on. Believe it or not, the drum is actually spinning here. Sometimes, I’m impressed by what my cheap little point-and-shoot camera can do. And then I remember that it’s got no time-lapse or long-exposure settings, and I stop being impressed. Either way, in this picture, the top of the container is experiencing about 237 gees (2,322 m/s^2). The bottom is experiencing 372 gees (3,649 m/s^2). The difference is because the top of the container is significantly closer to the axis of rotation than the bottom, and the acceleration is the distance from the axis times the square of the angular velocity. I’m surprised how well the space capsule tolerated the gees. I shouldn’t be surprised. After all, lives are at stake here. The capsule was engineered to survive all conditions. Still, considering how many times that capsule has been through the dishwasher, I’m impressed that it didn’t collapse. This is almost exactly how our juicy astronauts were when I pulled them out of the centrifuge. I moved them around for photographic purposes, but that’s it, and even I’m not clumsy enough to completely obliterate a plum just by touching it. At least not when I’ve had my coffee. The lime did remarkably well. It was noticeably flattened on the bottom, but it was very much intact. 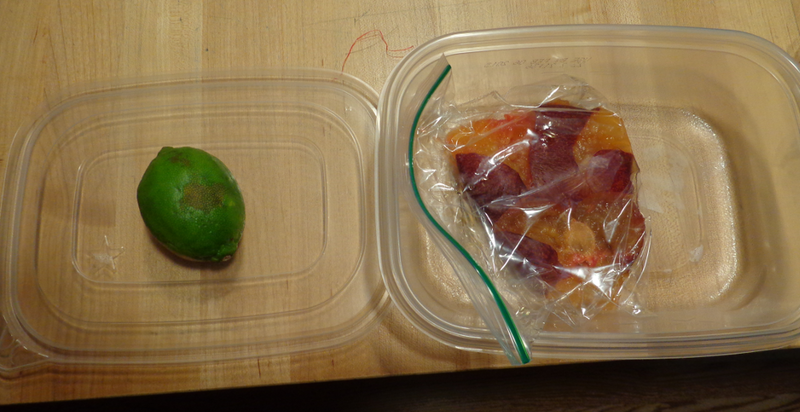 Now, under 1 gee (earth surface gravity), my scale says that a similar lime (someone ate my surviving astronaut; the nerve!) weighed around 100 grams. Under 372 gees, that lime weighed the equivalent of 37 kilograms. That’s 82 pounds. That’s the size of the dumbbells those really gigantic scary guys with the tattoos are always curling at the gym. It’s heavier than a gold bar. But the lime had little trouble. It’s the toughest substance known to man. I feel sorry for whoever ate it. But here you have an excellent practical demonstration of what I talked about in the last article. 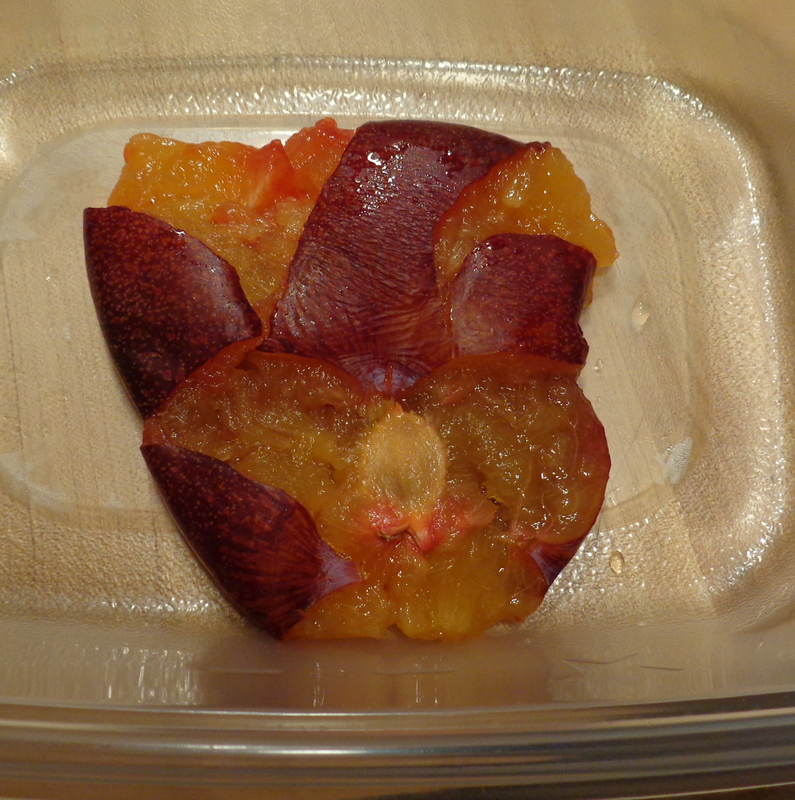 Under high acceleration, the weight of the plum exceeded its structural strength, and it split and oozed horribly all across the bottom of its bag. 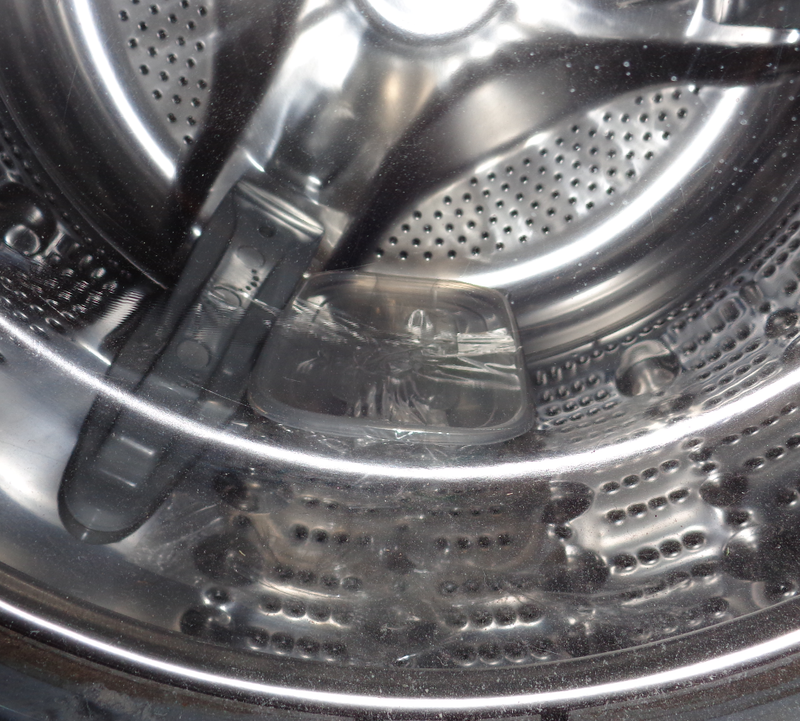 If the pit had been denser, it might very well have squelched down through the pulp and ended up on the bottom, but even my terrifying washing machine has its limits. → How Many Novels Can There Be? Fantastic articles! 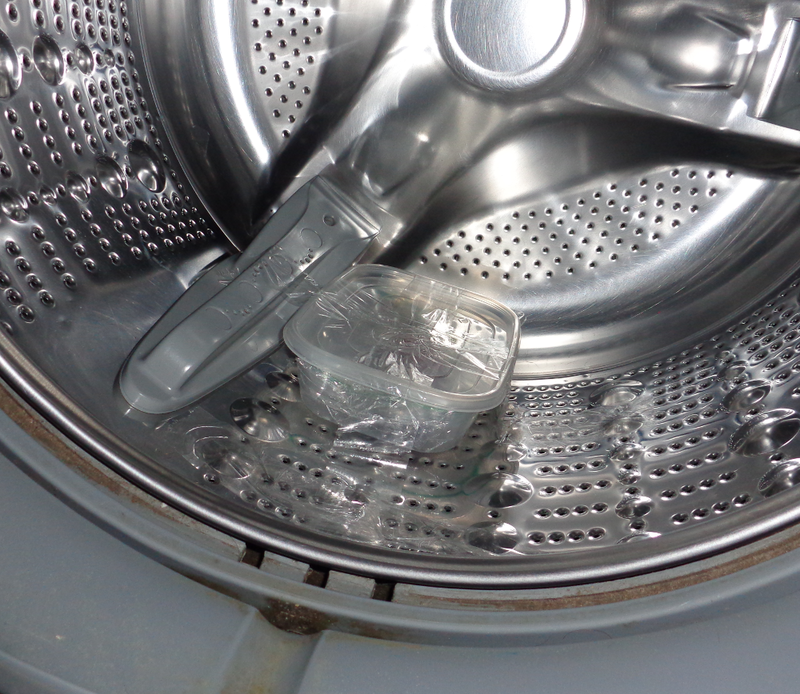 We’re curious, what equation did you use to determine the gee-force of your washing machine? Very cleverly written and with a wonderful sense of humor tossed in. We are thankfully not offended by squashed, pulpy fruit (it actually still looked pretty tasty). We’ll look forward to reading more of your posts (it’s nice to get a break from our research-based blog)! I measured the diameter of the drum at 0.55 meters, for a radius of 0.275 meters. The manufacturer lists the drum’s maximum rotation rate as 1,100 RPM, which comes out to 115.2 radians per second. The centrifugal acceleration formula is a = (radius) * (angular velocity)^2, which, for these values, gives me 3,650 meters per second per second, or 372.196 gees. Just for fun, I applied the linear-velocity version of the equation ( a = (velocity)^2 / (radius)) to the tires of my car. The tires have a radius of 7 inches (17.78 cm), and the fastest I usually get going on the highway is 80 mph (128.7 km/h). Turns out, at highway speed, the belts of my tires experience an acceleration of 7,192 m/s^2, or 733.6 gees. I’m surprised nothing in my life has flown apart yet.